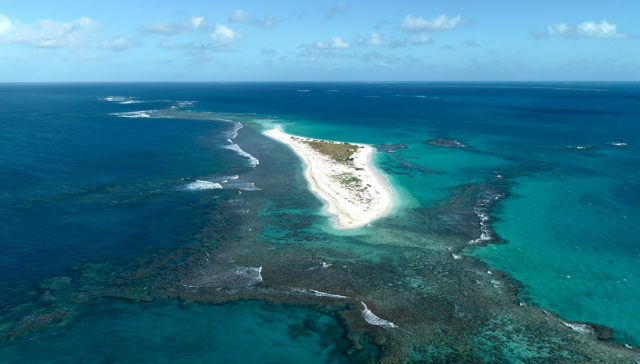 East Island was teeming with wildlife in the summer — turtles, monk seals, seabirds of all kinds. So how do tiger sharks know just when they should be there, too? FRENCH FRIGATE SHOALS — Several hundred miles northwest of Honolulu, in one of the most remote places on Earth, scientists are trying to unravel a mystery. Every summer, during a two- to three-week window, tiger sharks converge around an 11-acre atoll in the Papahanaumokuakea Marine National Monument. The tiger sharks have learned that the fledgling albatross leave their nests and make their maiden flight out to sea. Some of the young chicks don’t make it far from shore before they land in the ocean. And into the mouths of the waiting tiger sharks. Now, researchers are trying to figure out how these solitary animals know to travel to this one spot at the same time every year for an easy meal. A young albatross sits on East Island in July. The fledgling chicks sometimes land in the water just offshore on their maiden flights. Tiger sharks have learned this is an easy meal. 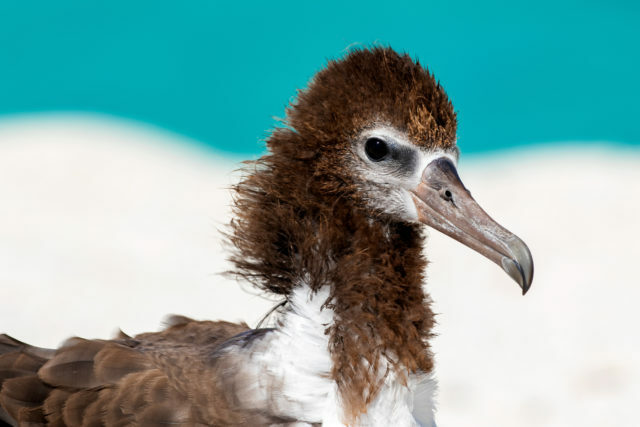 More than half a million seabirds breed in French Frigate Shoals, including 2,500 pairs of black-footed albatross and 3,500 pairs of Laysan albatross, according to the U.S. Fish and Wildlife Service. The birds like these islands because they are relatively predator free — at least on land. In July, shark researcher Carl Meyer and his team from the University of Hawaii’s Hawaii Institute of Marine Biology boarded the 96-foot research ship M/V Searcher for a two-week expedition in the monument. They were accompanied by dozens of coolers filled with frozen ahi heads. Shark bait. After three rough days at sea, the Searcher arrived at French Frigate Shoals as the sun was setting. The next morning, sea birds circled the boat as crew members loaded a small skiff with multiple trash cans of gear. Anchored off of La Peruse, a tall monolith island, the smell of bait, salty lifejackets and engine exhaust was strong. There were no clouds in the bright blue sky to filter the rays of the hot white sun. Crew members covered their skin head-to-toe. Wind guards protected their lips from the reflection off the water. In July, East Island was a flat 11-acre atoll where tiger sharks patrol the shallow lagoon for young albatross that crash land in the water as they’re learning to fly. The sandy island was also the nesting site for 90 percent of endangered Hawaiian green sea turtles and pupping grounds for endangered Hawaiian monk seals — more food for hungry tiger sharks. Shark researcher Carl Meyer and his team work to reel in a tiger shark so they can tag it as part of their study exploring how these animals know to come to French Frigate Shoals each year to feed on fledgling albatross. Catching tigers sharks off the shores of East Island has proven difficult for Meyers and his team because the sharks aren’t interested in the bait when there is an endless supply of fresh baby birds to eat. But this trip was different. 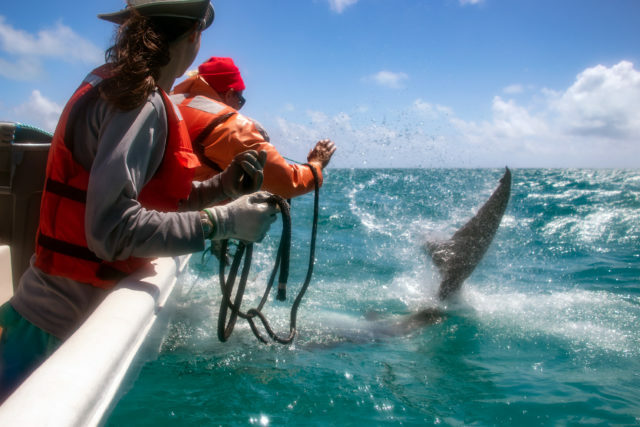 On the crew’s first day out, they caught and tagged five female tiger sharks and even managed to attach a camera to a 14-foot shark, mounting it on a thick sturdy pectoral fin. Flipping sharks on their back put them in a trance-like state, making it possible to take measurements and tissue samples. Each of the sharks was tagged with an acoustic receiver, which is used for long-term tracking to learn sharks migration patterns. Acoustic transmitters dropped in various locations around French Frigate Shoals pick up data from the tagged sharks as they swim by. They pulled in the last hook after a few hours of tagging. But this shark wasn’t putting up a fight. The nylon rope was wrapped tightly below the gills multiple times, a noose around its neck. The scientists worked hard to revive it, but ultimately they released it and it sank, slowly, to the ocean floor. Incidental “takes,” as they’re called, happen. But Meyer says he hasn’t had a shark death in over 10 years and has never had a mortality in his 15 years of working in the monument. Still, the death ended the tagging project for the rest of the trip. East Island, one of many islets in French Frigate Shoals, was the breeding ground for numerous albatross — and many other seabirds, seals and turtles. This is the island in July, before Hurricane Walaka obliterated it in October. Meyer noted that the shark-tagging is done under permit so when the state asked that the tagging stop, it stopped. “It did mean that our sample size was slightly smaller than I would like it to be from a scientific perspective, but we were still able to get tags deployed and tissue samples harvested,” Meyer said. The sharks that were successfully tagged — and especially the fin-mounted camera — have already started to reveal new information about shark behavior, migration patterns and feeding habits. Knowing more about sharks, the ocean’s top predator, helps scientists better understand the marine environment as a whole. As Meyer explains, the presence of sharks is a strong indicator of a healthy ecosystem, which people around the world depend on. Epilogue: Earlier this month, East Island was largely destroyed by Hurricane Walaka, which devastated the atoll and surrounding area. Satellite photos confirmed this week that the atoll had virtually disappeared. Scientists are concerned that the loss of the land will have significant impacts on the endangered species and other wildlife populations that had relied on the area.